Most istanbulites have at least once in their lifetime made the Bosphorus boat trip with a ferry starting at the Galata Bridge at the mouth of the Golden Horn and travelling crisscross between the two continents all the way up to Black Sea, but can we make the same statement about the other ferry boat trip; the one starting from the same location and travelling into the opposite direction into the Golden Horn to Eyup? Until the last few decades Golden Horn has always been the inland water channel we are used to watch from uphill, hiding treasures and sunken ships of Byzantium in its blurred waters which had a bad odor. This lake like water channel called Halic or what the Europeans always referred as the Golden Horn has always been a mystery to people It was closed off by the Byzantines with iron chains to prevent foreign ships to enter inside and the Ottomans and Turks built and replaced a bridge there three times. I had walked in my youth hundreds of times on the old Galata Bridge, which had fish restaurants, used bookstores, the lottery shop of the famous Uzun Omer, and ferry boat stations on the lower level. The upper level of the bridge was used by tramways, busses, taxis and pedestrians crossing the Golden Horn. The old bridge was burned down in the nineteen eighties and replaced by a new one. During the same time Golden Horn was cleaned from the pollution and waste and once again turned into an extension of the Bosphorus with blue waters,where hundreds of different fish lived. Because of all of these improvements , a ferry trip on the Golden Horn had become a very attractive project every time I have visited Istanbul. 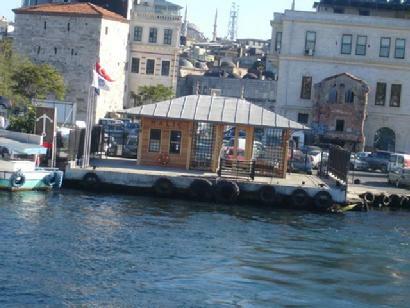 I had made my plans for such a ferry boat trip on the Golden Horn on a sunny day in September. First I took the ferryboat from Kadikoy to Eminonu, got off at the ferry station across Yeni Cami, using the pedestrian walkway by the Galata Bridge and started looking for the boats leaving for Eyup. The passage under the Galata Bridge looked like a crowded underground city where thousands of people tried to make a living. Both sides of the stairs going down was taken by people who tried to sell you something .The crowd of sales people was extending all the way to the shops into the passage which looked like a little mall with exits in three different directions. The loud voices of the sales people, the arabesque music sound coming from the shops, the smell of kebabs and lahmacuns were all getting mixed together and creating an organized chaos.There were all kinds of people here, selling something: lahmacun the Turkish pizza equivalent, bottled water, simit the famous Turkish sesame bagel rings, combs, watches, bracelets, beads, cds , dvds, tapes.. Also young boys were trying to polish your shoes, an old women trying to get your weight on a scale for few cents, a toy store attendant flying a helicopter above your head, an old man trying to sell a soccer jersey, a lottery salesman showing the ticket in his hands. Istanbulites going to work were trying to find their way through the crowd while confused tourists were watching the chaotic atmosphere. Since there was at least one hour to the boat trip I decided to take a walk on the Galata bridge. Both sides of the bridge by the rails were crowded with amatuer fishermann with their long rods, including some Japanese tourists who were also fishing. I kept walking from the Galata bridge towards Misir Carsisi, the Egyptian Market behind the Yeni mosque to the nursery shops selling flowers and seeds. For years the shops here have provided people of Istanbul with vegetable and flower seeds. Flowers in pots, cut flowers or roots of flowers were displayed in the shops, which were crowded by people from all districts of Istanbul talking to salesmen. The shops in row by the outside walls of the covered Egyptian Market looked like flower gardens with their colored flower pots: red and white carnations, yellow and pink ivy roses, purple and lavender hydrangeas, white magnolias and jonquils, hyacinthus, narcissus and basils. After wasting some time by these flower shops I walked to the other side of the Misir Carsisi where the cheese shops and charcuteries were located, down to the bus stops and crossing the street towards the Golden Horn ferry boat station. The little ferryboat station with its blue and white painted sidings looked like a miniature wooden boat house. In the front of the building there was a ticket booth big enough to fit only one person inside, a tourniquet to allow passengers to the waiting room, a glass door opening to the wooden dock with railings painted navy blue with flower pots of red sardinias hanging from them. A giant tractor tire was placed on the front side of the wooden dock to lessen the impact of the arriving boats. The ferry boat which arrived from Uskudar looked like a tiny model boat rather than a regular Vapur, the ferries travelling back and forth on Bosphorus. The round trip ticket to Eyup was cheap, the mere cost of two simit bagels and there were only five or six passengers boarding the 11 :30 boat from Eminonu. I went up to the deck and sat down next to the two Spanish girls who were checking their maps in their hands. In front of me there was a young woman with a head scarf and a little boy with the customary circumcision cloak and hat and a man in his early seventies with thick white hair and a zappa mustache.The boat departed on time for the round trip which is scheduled for an hour. I got up and started staring at the blue waters of the Golden Horn with excitement and taking few pictures of the historical sites. Rising on one of the seven hills of Istanbul was architect Sinan’s masterpiece Suleymaniye Mosque next to the Beyazit Tower, little further down the Fatih mosque decorating another hill, the Valens aqueduct as if all in a parade in front of my eyes. In the back part of the Valens aqueduct there was an old Byzantine type of building resembling the Hagia Irene, next to a smaller mosque, a typical scene surrounding Golden Horn area, people of different ethnic backgrounds living next to each other and worshipping their own religion. The man sitting next to me was reading the daily Cumhuriyet and smoking his cigarette. He had big hands and a face with almost a copper tan, the look of a fisherman or a farmer, who worked with fishing nets or the soil all his life. With his greyish blue eyes behind his black glass frames and his still thick and tangled white hair he looked younger than his age but like somebody who had seen a lot during his lifetime. As I was zooming with my camera to the old Byzantine building he asked me if i was taking the picture of the Zeyrek Mosque. This church was built by Empress Irene in the 12. Century. When she died her husband built a second church in the name of Mary. But these two churches were so close to each other that later emperor Kemensos decided to built a third church in between and connect all three churches together. When Mehmed II. conquered Istanbul he gave the complex under the management of a Mullah named Zeyrek who in turn changed the place to a medrese, a school of religion as well as science and arts.This Church complex is still considered the largest one after Hagia Sophia in size and one section is used today as the Zeyrek mosque, while the church sections are under a major renovation project. Our boat had just passed under the Unkapani Bridge and was sailing in the grayish blue waters of the Horn. Little farther away, the old Galata bridge burned down years ago was towed here to the two sides of the shore line, with the middle part missing, like a skeleton reminding one of the old days. I asked the older guy sitting across from me how he knew so much about this area and if he was from here. He started by saying that his whole life was spent here at the Halic where long time ago his grandfather had come from the Black Sea region and settled down. My grandfather a young and stocky Laz * then, came from Trabzon and rented a room at the hostels where single people stayed, before settling down permanently in the Kasimpasa district. He worked in any and every kind of job, starting as a boatman by carrying passengers between Eminonu and Fener in his little kayik. When he got tired of this, he started waiting tables as a server at the Beach Casino Restaurant in Fener. The restaurant , known as the Kazikli, was a place where high ranking Beys and Pashas frequented to listen to live music and entertainment while having few drinks. The entertainment which started at the restaurant was usually followed by boat trips in the Kagithane stream accompanied by women. My father the youngest of three brothers had fallen in love with a Rum* girl and despite both families opposition married her. With time my mother adopted Islamic traditions and customs and in her late years she had become a devoted Muslim praying five times a day. My father had worked for years at Suraski shop located in Eminonu by the Denizcilik Bank as a suit salesman. 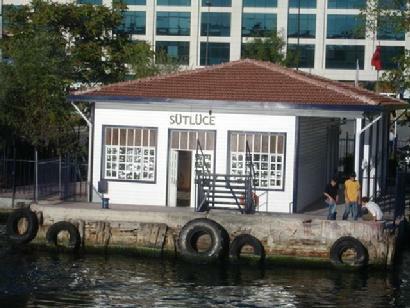 At that time all uniforms, caps of private schools in Istanbul were sold here at Suraski. I was going to ask him what he did for living , as if he knew what I was going to ask, he changed the subject and pointed to a very attractive church at the shores of Fener and asked me if I knew the history of the Bulgarian Church. I glanced to the shore where the old wholesale fruit markets and abandoned old wooden houses used to be. They were all gone and the area cleared now and the historic church was more noticeable. 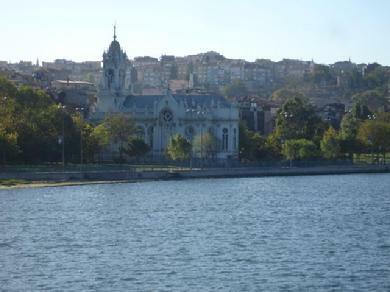 The building with its greyish lead color was in perfect harmony with the waters of the Golden Horn and the dark green oak and plane trees in its backyard with the white fence. With its nineteenth century neo gothic design and the bell tower which is not seen in too many churches of Istanbul, the Bulgarian Church was really a unique building. The Bulgarian minority living in Fener during the the beginning of nineteenth century were under the Ottoman rule but in religious affairs they were affiliated with the Greek Patriarchy. Not having a church of their own, a Bulgarian priest named Stephan Zvetti had asked the Ottoman Sultan for permission to build a church here. The Sultan granted the permission to the Bulgarian priest but under one condition; the church had to be built only in one month. Getting help from the Russians, Stephan Zvetti started building the steel casts of the church In Vienna. It took almost three years to construct all portable parts of the building and then to ship them on the Danube river to the Black Sea and from there through Bosphorus to the Golden Horn. It only took a month to assemble the church at the shores of Fener. My childhood was mostly spent here in Fener. Since my mother was from Rum origin, I had both; lots of Rum relatives and friends. Pandeli was such a friend , and a very close one.This big red building you see on the hill is the Rum Boys High School where Pandeli spent his middle and high school years. In those years I always had found this school very unusual with its high ceilings, rooms full of sculptures and paintings representing Greek mythology, and Christian saints. The school library was stuffed with ancient Greek and Byzantine books and works. 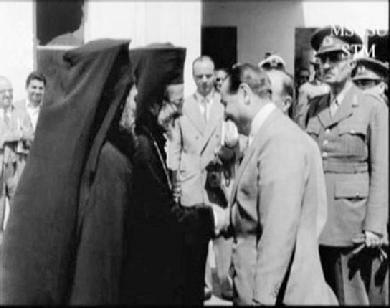 I remember vividly; it was early nineteen fifties when the Prime Minister Adnan Menderes was going to visit Greek Orthodox Patriarch Athenagoras. I met Pandeli at the school that day. Both sides of the street on the hill declining towards the Patriarchy building was full of children with little Turkish paper flags in their hands. At the front doors of the patriarchy there were several priests standing in black robes who had long white beards. Some of them had also gold crosses and chains on their necks and purple cloaks with gold embroideries. Finally the moment everybody was waiting for had arrived, the black cadillac with the red license plates stopped at the front of the building. First Ahmet Salih Korur, the Deputy Prime Minister got off the car followed by the “Basvekil”, Adnan Menderes the Prime Minister himself. He had a navy blue suit with thin lines on, a matching necktie with white dots and a white handkerchief in the pocket of his jacket. His black hair was carefully combed to the back. When Menderes saw the Patriarch greeting him by the door a big smile spread all over his face. Both leaders shook hands and then the doors closed behind them. This was to be the first and last time I was going to see Menderes. Actually Menderes was a very humanitarian person with lots of tolerance. His visit to the Greek Patriarch was used for years by his rivals against him. Who could foresee that a man who started with this type of good will, would end up one day by the gallows. Come to think of it, isn't the Ottoman and early history of the Turkish Republic full of executions like this ? The Patriarchy you see just below the “Red School” had witnessed such an execution in 1821. Even today, the middle door among the three front doors of the building is painted in black and still locked. The Patriarch at that time, Gregorius IV . 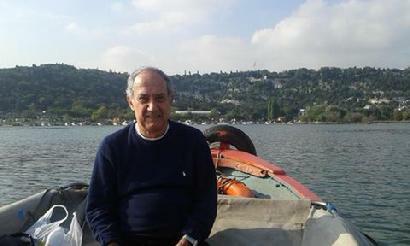 was born in Mora, the peninsula of Peloponnesos. During the reign of Sultan Mahmut II. a rebellion by the Greek population had started on the peninsula of Mora and the Sultan was suspicious of Gregorios. Worried about the Sultan’s suspicions, the Patriarch declared that the rebellion was illicit and the he was loyal to the Sultan. However this declaration was neither good enough to end the rebellion nor to overcome the Sultan’s suspicions about him. Following the easter ritual in 1821 Patriarch Gregorius was hung by three sergeants at the gallows set in front of the Patriarchy's doors. His corps stayed here for three days until some citizens of Jewish origin pulled his body to the shores of Golden Horn. According to the tradition a big rock was tied to his feet and the body thrown into the water.It was rumored that the body got rid of the rock and started floating on the water when a Russian ship with Greek sailors saw the the corps and took it aboard the ship. They took the body first to the port city Odessa in Russia and following a religious ceremony to Athens where he was buried. From that day on Gregorius IV. was accepted by the Rums as a saint. While I was listening to the story the vapur had arrived at the Eyup station, the old man got up, wished me a good day and left the boat with the newspaper in his hand. After a thirty minute break here at Eyup the boat was supposed to return back following the same route it came from. While taking a sip from a glass of chay, I started glancing at the bay of Eyup, which almost looked like Bebek in Bosphorus, with several boats and kayiks anchored in its now clean waters. On the hills up the hill the white tombstones of the Eyup cemetery were resembling fields of wild daisies. Where the Golden Horn made a turn on the right there were two little islands turned to natural habitats with distinct birds, wild geese and storks living on them. About five or six passengers boarded the boat for the return trip. Some of these were tourists who had visited the Eyup Sultan Mosque and the famous Pierre Loti Cafe up the hill, others were Eyup natives going to work at the city. 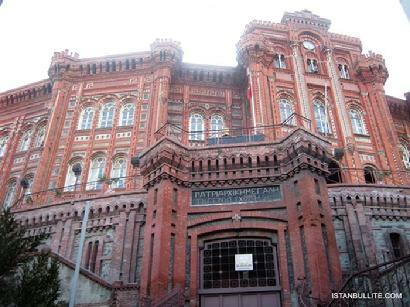 On the way back we passed by some beautiful and historic buildings like the old slaughterhouse turned into an Kultur Sarayi, an art building, the Rahmi Koc museum in Sutluce, the Feshane built by Sultan Mahmut II. for production of the Ottoman caps called fez, the Taskizak shipyards and the Kuzey Saha Deniz Komutanligi, the regional headquarters of the Navy. Then I thought to myself, had he been here, the old man whose occupation I never knew, would have told me the stories of these buildings.